A human figure stands in the centre of an aureole of fireworks. Fifty wooden sticks radiate from the man’s chest in all directions, corresponding as to form with the rebar steel out of which he is put together – see for instance the legs. The white body contrasts with the multicoloured firework rockets. The figure is hollow on the inside, the rockets are filled with powder. The human shape consists of non-combustible steel, while a small flame will make the surrounding missiles burst into brilliant light effects. The man stays on the ground, while the fireworks will shoot into the sky. The one will have a long life, the others will be consumed in just a few seconds. What do these contrasting materials say about being human? When we reflect on this further, we will grow in understanding of this artwork. The man who is standing in the middle of the installation is rendered in three dimensions by shafts of steel. He is fleetingly sketched and yet sturdily put into space with iron rods. These kinds of rods are usually employed to reinforce concrete. When the building is ready, they are no longer visible. In this shape, however, they form the casing that becomes increasingly more condensed toward the top of the figure. They work as a transparent armour giving both support and protection, yet allowing light to pass through. As the hands, feet and facial features have been generalized, the figure can represent any human being. Because the legs vary in length, the figure seems to pace through the space. He holds his arms back a bit, so that he carries the wreath of fireworks like a backpack on his back. The wreath conjures up associations with a propeller or wings that fan out, which turns this firework figure into a modern-day Icarus. But a firework show is always short-lived and accompanied by loud bangs and a lot of smoke. Except the memory of a magic spectacle only burned-out shells will remain. The artificial light effects do call up momentary amazement, but in the final analysis they are costly, polluting and harmful to health and thus neither durable nor acceptable. Therefore the installation leads to the question how human beings can create sparkling highlights without dependence on artificial means. How can we put shining accents that will have a lasting emanation through our own actions? The sticks of the fifty rockets radiate from the centre or heart of the figure. Everything we think, do or say springs from the heart. When this thinking, doing and saying is good, it will have positive effects. Jesus says in the sermon on the mount to his audience: ‘You are the light of the world … Let your light shine before others, so that they may see your good works and give glory to your Father in heaven’ (Matthew 5:14,16). For Jesus this light is a consequence of good works and has a twofold illuminating power: that others will see the good that is done and at same time will acknowledge him, who is the source of all goodness and touches and drives our hearts deep within us, quietly and without sensationalism. What is brought about by God, possesses a natural radiation. It does not need to be spread out with great pomp as the fan of a peacock and it does not need to be shot into the sky by artificial propulsion. A Latin proverb summarizes it well: ‘Good deeds spread their light also in the dark.’ They do this without the help of any clever devices, simply because they are good! 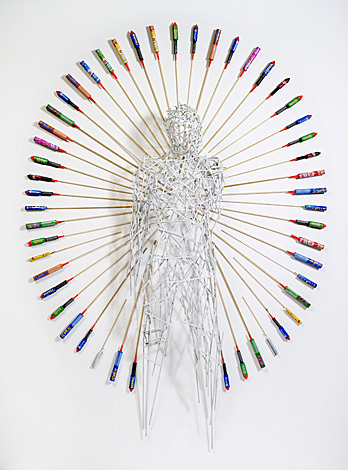 Hans Thomann: Aureole, 2011, rebar steel with 50 firework rockets. Hans Thomann was born in Uzwil, Switzerland in 1957. He lives and works in St. Gallen. From 1978 until 1980 Thomann attended the arts and crafts school in St. Gallen. In 1981 he participated in the master class of Mario Merz in Salzburg. He won several prizes and obtained many commissions from inside and outside Switzerland. 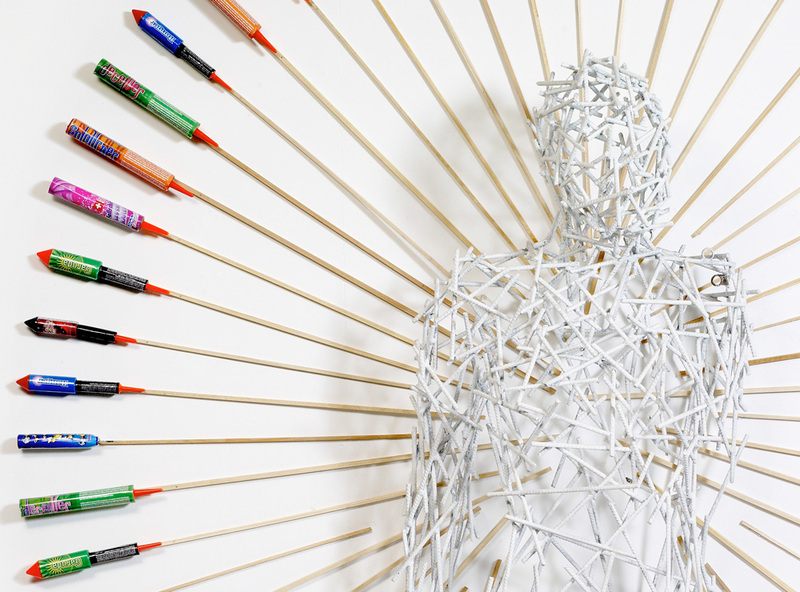 He makes drawings, paintings, sculptures and multi-media installations. He is a member of the Swiss St. Luke Society for Art and the Church (St. Lukasgesellschaft für Kunst und Kirche). For more information and to see more of his work, see www.hansthomann.com. Patrik Scherrer is the driving force behind the German website Bildimpuls. Every fortnight he sends out a ‘Bildimpuls’ or visual meditation, in which he focuses on contemporary Christian and religious art from Germany, Switzerland and Austria. He studied theology and works with the mentally handicapped. He wrote the book Gott in Sicht? 33 Impulse zum christlichen Glauben aus der Pinakothek der Moderne, Schnell & Steiner, 2005. On the Bildimpuls website there is also a lot of information about artists, books, museums, exhibitions and organizations, see www.bildimpuls.de.